Hudson's Bay Company post Prince George, about 1910. BC Archives D-07330. Railways played a critical role in developing British Columbia's economy. New towns, new businesses and new people all appeared as railways spread across the province. When word spread in 1908 that the new Grand Trunk Pacific Railway was coming to Prince George, land sales boomed and the small Hudson's Bay Company trading post quickly grew into a bustling community. Fort George and South Fort George both tried to convince the Grand Trunk Pacific to build the new railway station in their community, but the company chose a third location and called it Prince George. The city of Prince George contains all of these communities. This is a black and white image of five connected photographs showing Fort George with arrows to click through each of the five. This is a black and white image of 4 connected photographs showing South Fort George with arrows to click through each of the four. 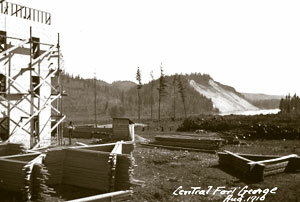 New construction in Prince George, 1910. BC Archives I-57986.